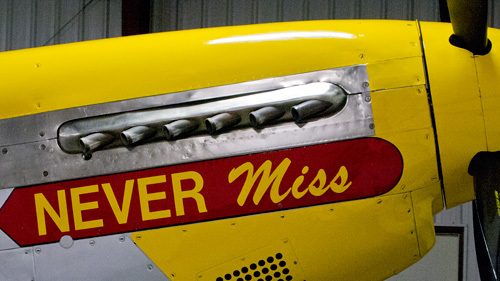 'Never Miss' P-51 Mustang. Olympus E-PL1 at 42mm with 14-42mm kit lens capture at f5.6, 1/80 second and ISO 1600. We made the acquaintance of the stunning Never Miss on Sunday as we recuperated from our wedding video adventure. Delivered to the U.S. Air Force on March 9, 1945, she's still flying that 12-cylinder Rolls Royce engine but doing it in private hands now.